As towns and cities continue to expand and new urban extensions are being planned, urban design remains a crucial skill in creating a vision for how a place works and looks. This workshop provided an overview of what are the most important values that urban design offers in the improvement, planning and protection of places. DSE has now delivered two of the nine Kent Design – Design in a Nutshell member training events in the 2015-16 programme. We are so delighted with the feedback from the Councillors that we thought we should share it to ensure that other Councillors can hear about how well it has been received. The Kent Design training lasts 2.5 hours and is led by DSE across 5 distinct themes. The session has time for three discussions about the learning and local experiences – these have been highly valued by attendees. A workshop element encourages Councillors to review a real scheme commenting on the urban design skills they have developed. 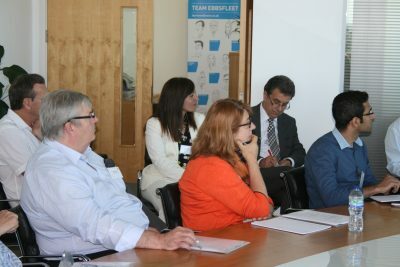 So what did Councillors think of the training? 70% of attendees said it was very good and 30% said it was good. In addition, 75% of Councillors strongly agreed that the Kent Design training would help them undertake their duties. Councillors have commented on how informative the training was and how it has encouraged them to look at masterplans and development in a different way. In summary, 100% of Councillors said that they would recommend this training to other Councillors. If you are not a member of Kent Design and would like to find out more about how your organisation could benefit from membership, please contactkentdesign@designsoutheast.org.